Anyone working with industrial vacuum cleaners will be aware that these machines have a variety of working parts that allow smooth and efficient operation. The best way to keep this type of floor cleaning equipment working at peak performance is to undertake regular servicing. 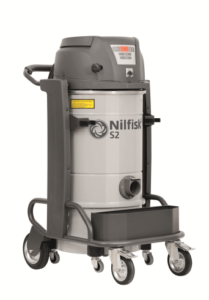 Industrial vacuum cleaner servicing is best conducted by a professional company such as CL Floorcare. There are many moving parts within this type of high use equipment. Any of these parts can fail causing the vacuum to work at a lower performance level or even stop working completely. We also offer an industrial vacuum cleaner repairs service to ensure your equipment is back in perfect working order as soon as is possible. Our technicians are experienced and are qualified to work on all brands of industrial vacuum cleaners. Call us on 01782 749451 or email sales@clfloorcare.co.uk. With our experience of dealing with Industrial vacuum repairs over many years, we can rapidly find the cause of any issues. If the equipment is not functioning to the required standard it may not be as simple as a blocked hose, there are several ducting areas within the machine that can cause issues. It may be that the motor needs repairing or replaced. Whatever the problem our technicians have the parts and the experience to rapidly solve the problem and ensure that the vacuum is working to its full ability. Extensive Inspection and Accurate Diagnosis. Our technicians will complete an in-depth inspection of the equipment to accurately diagnose the cause of the malfunction. Our resolute team of experts takes pride in analysing and diagnosing faults so that they only replace parts that are necessary to ensure the equipment is returned to its full operating condition. Accurate diagnosis is vital since a part may have failed due to the failure of another part. Our team will ensure that all issues are resolved, with all necessary parts being replaced using genuine parts to reduce the potential of future problems. Why Choose Us for Your Industrial Vacuum Cleaner Repairs or Servicing. CL Floorcare offers an individual service that is completely dependable. Whether your equipment needs a service or repair with short call-out times we will ensure that we are with you as quickly industrial vacuum cleaner as is possible and more importantly that your vacuum is back in operation as quickly as possible. Our technicians are up to date with Industrial standards and new equipment enabling them to supply the most up to date solutions. Our rates are competitive, and we will be pleased to supply a free quote for you. Consult CL Floorcare for your industrial vacuum cleaner servicing or repair. We care, and we have the experience to solve your problems.